1) Romney unable to win nomination outright. 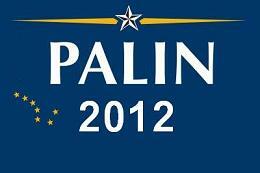 Brokered convention, and a dark horse emerges … GOP ticket is Palin-Christie. 3) Down/S&P down 25% until Fed begins QE-3 in Summer ’12. Ensuing rally is up 25%, just in time for election day. 4) Joe Biden has a stroke 3 weeks before the election and is permanently disabled. Replaced by Hilary Clinton. 5) North Korea’s new head dude plays his first round of golf. Hits 3 holes-in-one. 6) House votes to begin impeachment hearings against Eric Holder. Holder resigns, blames racism. Race riots break out in Tampa and across the nation during GOP convention. 7) Mississippi State University wins the National Championship in Basketball and Baseball, and is ranked #1 in the BCS Poll in Football as of 12/11/12. 8) Scientists at MIT create both cold fusion and synthetic gasoline. They are immediately sued by the EPA. 9) Tina Fey is keynote speaker at Democrat Convention. Since this holiday brings family together, families that we don’t get to chose, but God Bless’em they are ours, we have this humorous song. May you all have a wonderful Christmas. Saw this over at the Lighthouse……. It’s really not too late. Especially since the GOP changed the primary system from winner-take-all to a proportional type of campaign. In fact, I can envision a write-in tidal wave of Palin supporters who are willing and able to propel Sarah to a Primary victory. And, given the hate-fest she has endured from the left, any nastiness from the Romney campaign will be a pesky annoyance by comparison. Or, how about they fight it out at the GOP convention! Wouldn’t that make some great television. C’mon Sarah! Time to bring your “A” Game!! Why do conservatives distrust Mitt? Of course it is the truth, there has never been a Palestinian state, only a Palestinian Mandate that was intended as the Jewish homeland. The Middle East war is not now and never was a conflict between Israelis/Jews on the one hand and Palestinians on the other. In fact, the Arab-“Palestinians”, while currently the perpetrators of most of the anti-Jewish atrocities, were never a very important part of the conflict. In fact, before about 1970, virtually no one in the world considered the Middle East conflict to be one between Israelis and Palestinians. The term “Palestinian” itself had referred to Israeli Jews back in the 1940s, and had been slowly deconstructed and redefined to refer to the Arabs in the West Bank and Gaza. The Middle East Conflict was always a war by Arabs against Jews, not a conflict between Israelis and “Palestinians.” The war was repackaged as a conflict between Jews and Palestinians as a public relations gimmick by the Arab fascist regimes. These regimes had never had any interest in “Palestinians,” in creating a “Palestinian” state, or in “Palestinian nationalism” before 1967. That is because Palestinian nationalism did not and DOES NOT exist. The Palestinians were a regional group of Arabs having virtually no cultural nor national distinctive traits separating them from Syrians, Lebanese, and Jordanians. They are all basically Arabs!. The bulk of what are called “Palestinian Arabs” are members of families who migrated into the Land of Israel beginning in the late 19th century. Palestinian nationalism is a mislabeling of Arab nationalism. Arab nationalism exists, although it is closely bound up with Islamic nationalism and even Islamism. Palestinian nationalism, however, is a phantom. It is nothing more than genocidal hatred of Jews! The Arab assaults and aggressions against Israel in 1948, 1956, 1967, 1968, and 1973 had nothing to do with Palestinians. The Palestinian terror campaign would itself be easy to suppress today and eradicate if the Middle East conflict were really a Palestinian-Israeli conflict. Israel would simply obliterate the terrorists and expel their supporters to Syria and Lebanon. The Middle East war continues because it is really an Arab-Israeli war, not an Israeli-Palestinian conflict. It is also in large part a war between barbarism and civilization. In many ways an Islamic religious jihad against the Jews. Even though I don’t support Newt for a multitude of reasons, I do offer him praise for stating the truth of the matter in the face of so many lies about the Trans-Jordanian’s claims that they are “Palestinians.” More candidates need to either learn the truth or speak it when the issue is about Arab-Nationalism and Israel. 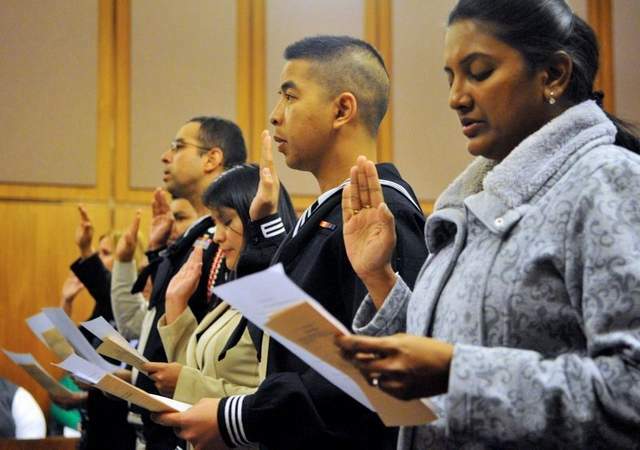 Daniel Alejandro McGregor of Peru, Mitchell Njeri Panniell of Kenya, Aaron Paul Nikko Fajardo Carlos of the Philippines, and Paavan Singh Nagi of India, all currently serving in the US Navy, and Edgar Ramon Leon of Mexico, Air Force, along with 15 others from 11 different nations took the oath of citizenship yesterday in the U.S. District Court, Hattiesburg, MS.
“In applying for U.S. citizenship, these applicants seek what is, without a doubt, the greatest status any nation can bestow upon them,” said US Atty Steve Graben. Filed under: News and politics | Tagged: News and politics |	Comments Off on Minority Report?